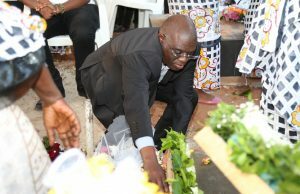 (Dar es Salaam) Ifakara Health Institute (IHI) seasoned researcher and former Deputy Director Dr. Godfrey Mbaruku, who died at his Mbezi Beach home on Sunday September 2, 2018 has been laid to rest at the Kinondoni Cemetery today. IHI Chief Executive Director, Dr. Honorati Masanja, led staff of the Institute who joined Dr. Mbaruku’s children, close families and friends as well as neighbors in burying the man they adored and worked with for many years. Dr. Masanja and some staff were given the honor of laying their wreaths on the grave amid a sombre mood. News on the death of Dr. Mbaruku was first broke to IHI staff by IHI chief human resources and operations officer Martha Baare in her brief email to all staff on Sunday September 2, 2018.